The goal of National Gymnastics day is to increase excitement and raise awareness of the sport of gymnastics. It is a platform to showcase the many benefits of gymnastics. As well as promote the ideas of physical fitness. 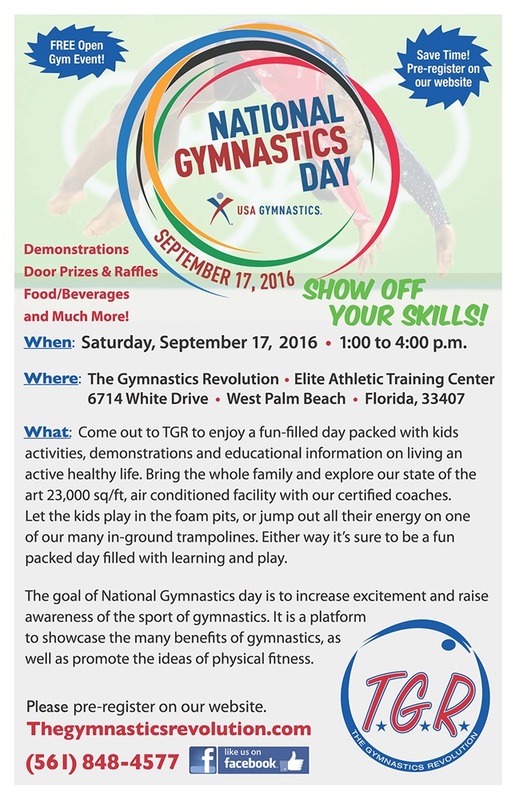 At TGR, we celebrate with a FREE community event with an open gym and demonstrations from our gymnastics athletes, door prizes, raffles, food/beverages and more. Don't miss out on all of the fun! This will be a popular event; in order to speed up your entry, please CLICK HERE to register. Up to five (5) children may be registered per form.